Washboard Roads? The Why, and How to Deal With It! Ah, yes, another leisurely drive down a country road. You’re motoring along peacefully until suddenly bump, bump, bump, bump. Crap. You’ve hit another patch of wash board road. You know, that aggravating, teeth-jarring pattern that shakes your steering wheel and beats the heck out of your suspension. “Why don’t they grade this road??! !” you yell. Well, they did some time ago. But countless cars later, the phenomenon has returned. And you get to experience the joy of riding over it. Those annoying ripples in the road are not only irritating and tough on your vehicle, they are also hazardous at higher speeds. Special care is needed to drive on such a surface. Adding insult to injury, driving on washboard roads actually makes them worse. As amazing as it sounds, the washboard effect is not caused by water flowing across the surface. “Wash boarding” is created as vehicles drive over a surface numerous times. Dr. Keith B. Mather proved this in an experiment in 1963. He published his findings in the January 1963 issue of Scientific American. In order to eliminate the suspension as an issue he was able to create the ripple effect by dragging a plow-like blade over sand. He determined that wash boarding occurred at speeds above 3 mph (below this speed, a deep rut was created). The principle behind it is similar to what occurs when you skip a stone over water. Each time the stone hits the water, it very briefly banks up water ahead of itself while also creating a divot-like gap behind. As vehicles repeatedly drive over loose surfaces, any slight bump causes their tires to bank up the material ahead of the tires while simultaneously digging out behind. The result is a rippling in the road. Contrary to what you might think, driving over those ridges will not flatten them. You can minimize the effect – discussed later – but the only way to eliminate the wash board pattern is to grade the road. The pattern will return, however. Wash boarding can occur on any loose surface (In fact, with enough weight, wash board can be created in rail road tracks). Off-road, we typically find it between the highway and the trailhead. Some areas are worse than others. 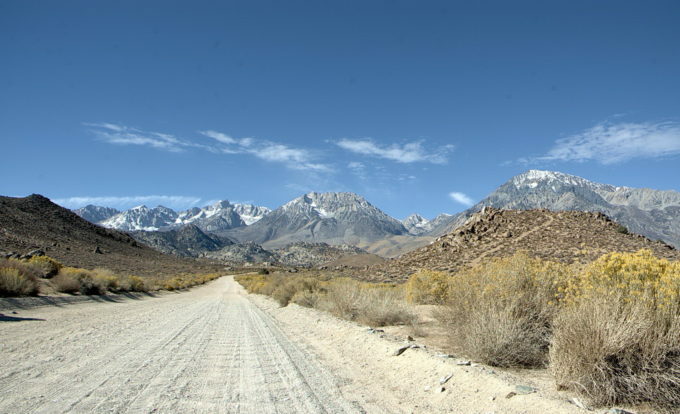 Death Valley roads, for example are just terrible. Beyond the simple annoyance, driving over wash board roads is dangerous and tough on the vehicle. Many people find that driving relatively fast over the rough road feels better. It does. You minimize the vibration inside the car, but at a great risk. Understand that at higher speeds your tires are in less contact with the road as they bounce from ridge to ridge. That means only a small fraction of the tire is making contact with the road. Turning and stopping distances are reduced dramatically on an already loose surface. It’s similar to driving over a slippery surface. Add in high speeds, and you’re asking for trouble. Your suspension, meanwhile, is taking a beating. The rapid up and down motion puts tremendous stress on the suspension and causes shocks to heat up and fail. The vehicle may feel level to you because your suspension is taking all the abuse. All that vibration and pounding cause bolts to loosen and parts to crack. Worn tie rod ends, worn out bushings and CV joints are possible, among other problems. Warning should also say: 95 miles of wash board available! Most people when they hit a bad patch of road pick the speed that minimizing the rumbling. Unfortunately, no matter the differences in suspension (coil, leave, LWB, SWB) that minimizing speed conforms to the existing wave like pattern and actually reinforces the wash board effect over time. Tires are packing down the soft spots and pushing dirt into the high spots. An interesting side note, Dr. Mather discovered the distance between ridges (wave length) increased directly with speed. These suggestions will help you deal with a bad stretch of road. 1. Air down the tires. The softer tires will give you a better grip of the road and provide more cushion. Hard tires create wash boarding faster as well. 2. Put your vehicle in 4WD HI. This will help you deal with sliding and skidding. Remember what it’s like to drive in ice and snow. Wash board has a similar effect on the vehicle. While in 4WD HI you can power up and turn into the slide a little bit to pull the vehicle out of a slide. That will help you maintain control of your vehicle. 3. Turn off your Automatic Braking System (ABS). The conventional brakes work better in loose material.Leave the cruise control off too. When you need to take control you can’t react quick enough to turn it off. Another possibility, though not as safe and possibly illegal, is to drive on a part of the road that doesn’t have the wash boarding. That could be the shoulder, the opposite of the road or even a berm along the side. Having even one set of wheels on a smooth surface can make a big difference, but watch for rocks, dips, and other hazards. The biggest risk is that every now and then you run out of bank and end up in a ditch. Or there’s a rock and if you don’t see it you’ll hit it pretty hard. Slow down, and watch the road carefully. NOTE: Some desert dwellers use the term “4-40” roads, where you either drive 4 MPH and take your time; or fly across the tops of the wash board at 40MPH like a boat over the waves. While we’re on the subject of gravel roads, let’s review some safety tips. As you know, driving on any loose surface requires extra caution. You may think that because you have large, wide tires you have unlimited traction. No so. Just like with snow, gravel offers serious challenges, especially at higher speeds. Follow these suggestions whenever you drive on gravel. Inspect your vehicle before and after the trip for any loose parts, especially relating to the suspension system. Slow down. Because your tires aren’t gripping as well, turning and stopping distances are greater. If a tire gets caught in the soft low berm the grader leaves along the shoulder, you’re likely to jerk the steering wheel to compensate and end up flipping the vehicle. Wait until you are moving very slowly before you steer back onto the roadway. Most people drive right down the middle of the gravel roads. That means on coming traffic is right in the middle of the road too. Be alert for oncoming traffic and other hazards. Get over to your side of the road as you approach a curve or hill. A trip out in the country can be one of the more enjoyable ways to spend an afternoon. Knowing how to drive on unpaved roads will help keep it that way. Don’t drive beyond your skill level on gravel roads, and get out there and have some dirt fun! Nice info on the wash boarding effect. I have usually picked up the speed to help minimize the effect or tried to find a smoother spot in the road. But how does washboard become whoop-de-doos? And how come the ridges go all the way across the road in a fairly straight line? How does the right end know what the left end is doing?